Many wonder (including my wife) why I like going back to places that I have already been to, and end up shooting many of the same scenes that I have previously shot. The answer is that one of the most important factors in making a great photograph, besides the subject, is the light. The light changes every hour of every day, and you never know what you will get. I remember that a famous photographer was asked how he ended up getting a particularly great shot. His reply was that he had visited that spot every year for over 20 years, and he finally got the shot that was being asked about. This photo is an example of what can happen on any given day. I had been in Grand Teton National Park in July on a photo tour, and shot tons of images of Mount Moran from Oxbow Bend. When my son and I drove from Oregon to Connecticut in September, he wanted to stop in the park and stay a couple of days. 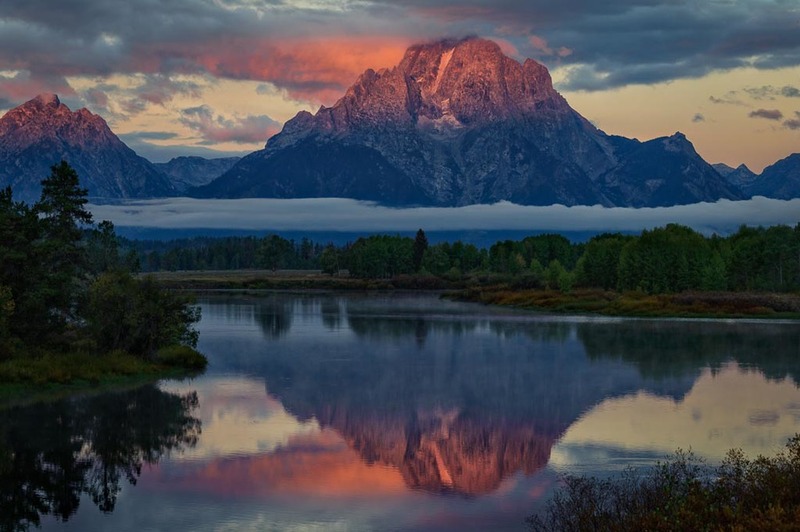 The first morning, off I went to Oxbow Bend and witnessed this scene. It was nothing like July (which was a beautiful morning), but the fog, clouds, and the sun met at the perfect moment to light up the top of the mountain. Ten minutes later and it was all gone, and anyone who came later that morning didn't know what they missed.